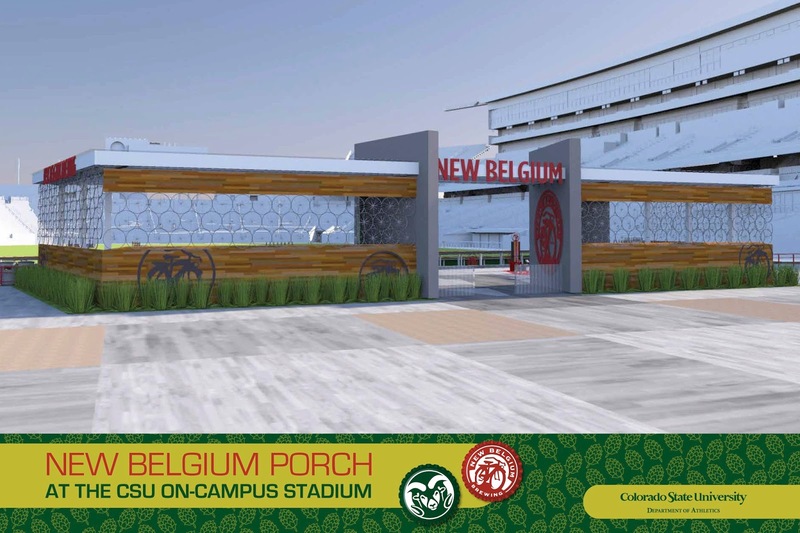 Talk about a BIG donation - it looks like New Belgium Brewery just donated millions to Colorado State University's new football stadium and in return will have a new "porch" built there branded with New Belgium's name. New Belgium continues to support local education in a big way. Here's the press release that explains it all. [Press Release] August 8, 2016 - Fort Collins, CO - Two Fort Collins stalwarts – Colorado State University and New Belgium Brewing Company – today announced that the iconic brewery is donating $4.3 million to CSU’s on-campus stadium project. The agreement gives New Belgium – creator of Fat Tire Belgian ale and other popular craft beers – naming rights to the north end zone hospitality area at the stadium, which will be called the New Belgium Porch. The agreement builds on an already-robust relationship between Colorado State and New Belgium to update and renovate facilities utilized by CSU’s Fermentation Science and Technology program. In 2015 New Belgium co-founder and former CEO Kim Jordan announced a $1 million gift to update and renovate facilities utilized by CSU’s Fermentation Science and Technology program. Jordan co-founded New Belgium in 1991 and was the longtime CEO before stepping down and tapping Perich as her successor. Perich has been instrumental in negotiating this agreement. - CSU recently announced it had raised $197.8 million for the 2015-16 fiscal year, the most ever raised by a university campus in Colorado. - CSU in the spring received two anonymous $20 million gifts – one to name the field at the on-campus stadium in Sonny Lubick’s honor, and one to CSU’s Institute for Biologic Translational Therapies - and another $13 million for scholarship and infrastructure, including the Michael & Iris Smith Alumni Center at the new stadium, from alumnus Michael Smith. - CSU set records for both academics ($166 million), and athletics ($31.8 million) fundraising in 2015-16. "New Belgium Brewing continues to be such a tremendous supporter of Colorado State University across the board," said Brett Anderson, vice president for university advancement. "They invest in our students and our institutional success time and time again. Their gift to the new on-campus stadium speaks to their focus on community-building and their desire to support places and things that bring people together. We are so thankful for their continued partnership and support." - Seventeen of the 22 suites have been sold. - Indoor club seating is completely sold out. - Only a handful of loge boxes remain. - Fewer than 10 percent of outdoor club seats remain. - More than 2,300 commemorative bricks to be displayed in the north plaza have been sold, with nearly 1,600 of the bricks purchased by first-time donors to athletics.